These were the scenes in Silver Street last night. (Photo: Tom Tranter). 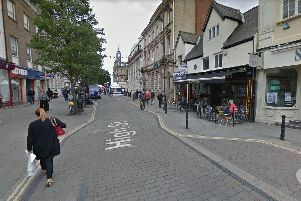 This was the incredible scene in Doncaster town centre last night as hundreds of England fans celebrated the Three Lions' thrilling penalty shoot-out win over Colombia. There were jubilant scenes as scores of fans decked out in red and white drank, danced and celebrated in Silver Street long into the night after England clinched their place in the quarter finals of the World Cup. The picture, taken by Tom Tranter, shows supporters dancing on bus stops and bringing the town centre street to a standstill once again in scenes reminiscent of previous England matches at the World Cup in Russia. But as usual, England's supporters were put through the mill with an evening of highs and lows and a rollercoaster of emotions before Gareth Southgate's side clinched their first ever World Cup penalty shoot out win to set up Saturday's mouthwatering clash with Sweden. Police and pubs expect crowds in Doncaster to be the biggest yet for Saturday's game -which kicks off at 3pm - with thousands of supporters set to descend on Silver Street once more. In previous matches against Tunisia, Panama and Belgium, the road has been the focal point of celebrations for England supporters, with a bus shelter collapsing under the weight of supporters during previous celebrations.